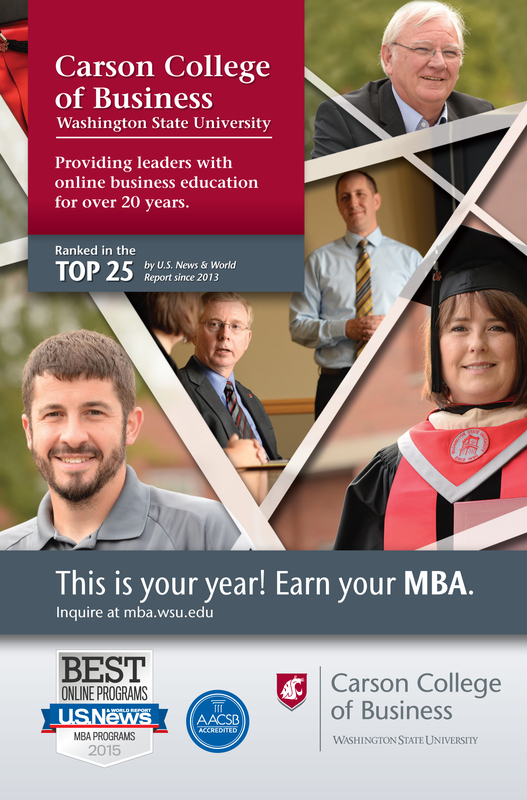 U.S. News & World Report announced the first ever Best Online Graduate MBA Program rankings naming the Washington State University Carson College of Business among the top 25 in the nation for its online MBA and Executive MBA programs. The Carson College ranked 21st compared to over 200 online MBA programs. The Carson College provides an engaging learning environment that develops relationships among students, faculty and the business community. Student feedback, dialogues with today’s industry and business leaders, and ongoing evaluation of traditional and online education, combined with the Carson College commitment to excellence in all of our programs, help guide program development. U.S. News & World Report’s rankings for Online Graduate MBA Programs were determined by peer assessment, ratings by business school deans with online MBA programs, and top distance learning higher education academics. Other factors included admissions selectivity, student engagement, faculty credentials and training, student job placement and student services and technology. In 2015, U.S. News & World Report ranked WSU’s Carson College MBA as No. 21. The Carson College has developed online education for more than 20 years. In 2012, the university created its Global Campus as a way to expand more program offerings and degree options online. The Carson College is among the top 2 percent of business schools worldwide to be accredited at all degree levels by the Association to Advance Collegiate Schools of Business (AACSB). Carson College online graduate programs include the MBA and Executive MBA, and undergraduate online degrees are offered in management information systems, management and operations, hospitality business management and accounting. Programs are 100 percent online and provide engagement opportunities with faculty, staff and other students. The online MBA program is geared toward students who may or may not have an undergraduate degree in business, with varying levels of work experience, and who wish to obtain deeper knowledge by earning concentrations in hospitality business management (available fall 2015), international business, finance and marketing. The online Executive MBA program requires at least seven years of managerial work experience and is targeted to business professionals looking to advance their careers to higher level executive positions. The WSU Carson College offers direct transfer agreements into our undergraduate program for associate’s degrees earned from accredited colleges in Washington state. Nearly 20 percent of the students in the online MBA and online Executive MBA are active military or veterans. WSU continues to develop resources to better support military service member’s financial and educational needs.